Julington Creek Plantation is large development in St. Johns County located south of Jacksonville, and has two large community pools. JCP built their newest clubhouse back in the early 2000’s, which includes a large fitness center, cafe, and two pools. 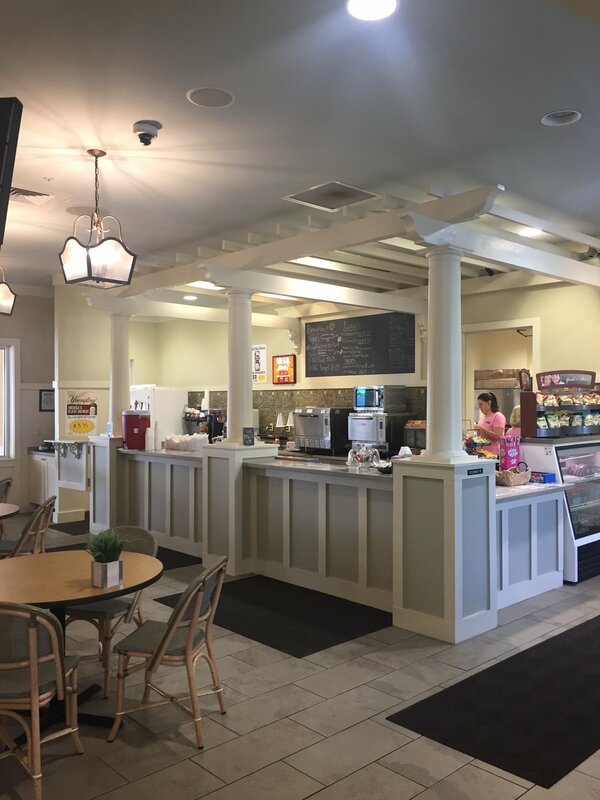 St. Johns County is booming with residential developments and clubhouses, and JCP knew they needed a little face lift to keep up with the surrounding developments, which is where Micamy comes in. The CDD at JCP wanted an updated, modern yet coastal look with more seating for the residents and their families. See below for the before and afters of this space! The entrance is somewhat of a lobby for this clubhouse. There is a large check in desk where residents scan their cards to enter the pool or the fitness area. The design team wanted this space to feel more bright and welcoming, and the CDD wanted to keep the usage of each space the same. The seating group in the corner is a place for guests to wait for their family or friends to check in to the pool or head upstairs to work out. It’s also just a great place to lounge and catch up with friends you’re more than likely to run into. This entire seating group is outdoor rated to accommodate those inevitable wet bathing suits. First and foremost the CDD wanted the indoor trellis that surrounded the cafe bar to be removed. This space is fairly large and the trellis only made it feel more enclosed. Removing it really opened up the space. The design team incorporated a waterfall edge on the bar, and used a gorgeous concrete tile at the face of the bar to add a little pattern. The showstopper is the blue subway tile that covers the entire back wall. The design team added floating shelves for extra display and storage. 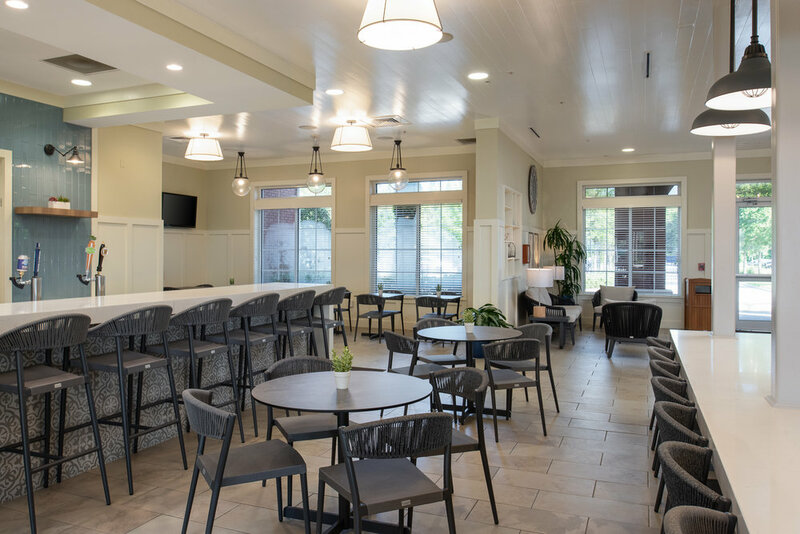 JCP needed to update their furniture to match their newly renovated clubhouse so the design team chose darker furniture to compliment the black accents throughout. 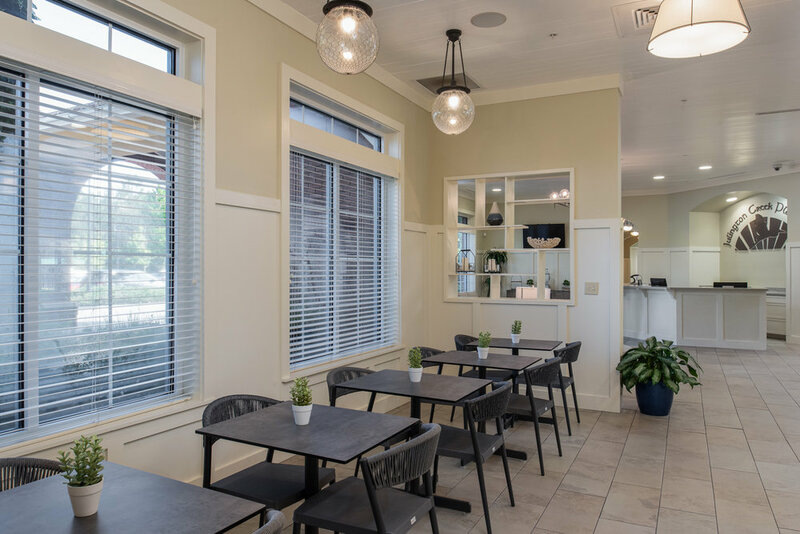 All the soft seating in this cafe and dining area are outdoor rated, so families can come in straight from the pool and eat their lunch. One of the biggest changes made to the space was the removal of the wall in the picture on the left. The design team proposed to remove this wall to open up the space even further, however they ran into a little problem. There were structural pipe columns located in the wall and the column you can see in the photo as well. Micamy’s solution? Incorporate them into the space by encasing them in a custom made, quartz waterfall gathering table. Not only did this truly open up the space, but it gave the clubhouse that much more seating for the residents.